Your table wants to be well dressed too. And a crocheted antique tablecloth is just what you need to impress guests, but only if it's still in its original, pristine condition. Old tablecloths lose their appeal and their value if they're stained and yellowed, but, sadly, it's difficult to find genuine antique textiles still in mint condition so many decades later. This is why it's important to learn how to clean these treasures properly. 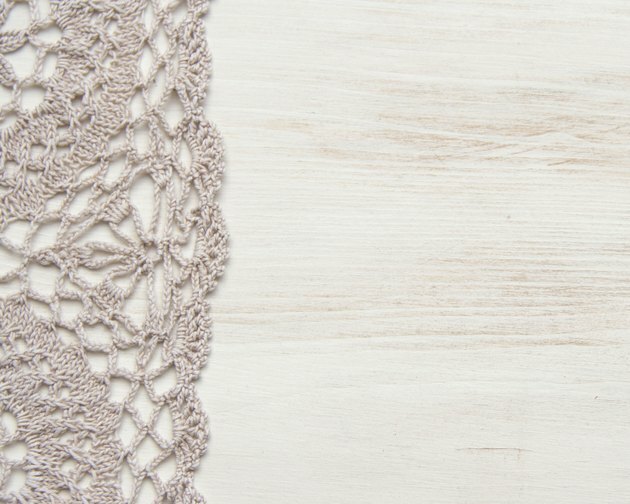 It takes a light touch and a gentle technique to whiten and brighten antique crocheted pieces without damaging their delicate threads. Antique crocheted pieces require delicate care and cleaning. According to the editors at Vintage Indie, a little white vinegar goes a long way toward removing stubborn stains on old linens. Submerge your crocheted tablecloth in a solution comprising 2 gallons of water to 1 cup of vinegar and allow it to soak for several hours, sloshing it around occasionally. Eventually, your cleaning solution should turn yellow as the stains on the tablecloth fade. If the vinegar doesn't work, try soaking your tablecloth again in a solution of Borax and hot water: 2 gallons of water to 1/4 cup of cleaner. The Smithsonian Conservation Institute offers another method of removing old stains on delicate fabrics; use a cotton ball or cotton swab to gently dab the affected area with a mixture of diluted, unscented shampoo or dishwashing liquid. More stubborn stains, such as those formed by oil- or protein-based contaminants, can be followed up by an application of diluted ammonia. Just take care never to mix cleaning agents such as shampoo and ammonia together, or caustic fumes can result. Plain old lemon juice is another effective stain remover for antique, white crocheted items. Lay out your tablecloth on a clean, white towel and dab the stains generously with lemon juice. Afterward, spread your tablecloth outside in the bright sun and allow the stains to fade naturally. You can use the lemon juice that comes reconstituted in the bottle, or you can cut and squeeze the juice from a real lemon. Stains that bind to fabrics are often tough to remove without the use of a detergent that contains enzymes. Many laundry detergents on the market utilize enzymes in their formula that are similar to the enzymes your body uses to break down proteins, starches and fats during the digestive process. The detergents work in a similar manner to break down and remove the same types of stains on fabrics. Usually, a soak in cool water with an enzyme detergent will remove stubborn stains.